About: Stamford Hospital is a 305-bed community teaching hospital, an affiliate of the New York-Presbyterian Healthcare System, and a major teaching affiliate of the Columbia University College of Physicians & Surgeons. The Need For Improvement: According to the CDC, hospital-acquired CAUTI increases length of stay, mortality, and hospitalization costs, with the average per patient direct costs and attributable mortality at $750 per episode. 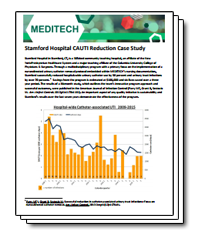 Despite broad-based education, hand-hygiene efforts, and environmental cleaning initiatives, Stamford Hospital’s urinary catheter utilization rates and CAUTI had not fallen over a five-year period. The Infection Prevention team developed guidelines for physicians to document catheter insertion criteria when ordering catheters. They also developed electronic order sets with Foley time limits. They linked the order for “Foley Maintenance Protocol”, which includes the nursing checklist for catheter removal to the physician’s catheter insertion order. Nurses regularly review the reason for a catheter and are required on every shift to document the patient’s voiding method. A nurse-driven protocol allows nurses to remove the catheter when no longer needed. Lowered the incidence of hospital-wide CAUTI numbers from 14 per quarter to 2 per quarter and hospital-wide CAUTI rates have trended down from 4.3 infections per 1,000 catheter-days to 1.4 infections per 1,000 catheter-days. An important aspect of any quality initiative is sustainability and Stamford’s results over several years demonstrate the effectiveness of the CAUTI program. To learn more, be sure to download our full case study.